On New Year’s Eve 2015, Corey Young told Chrissy Feltes he didn’t want to be her boyfriend anymore in the new year. “That sounded bad for a moment,” Chrissy says. Standing in the living room of their recently purchased first home, Corey explained he wanted a fiancee instead. The couple had met a few years prior in Steeleville, Ill., at a pool party. Corey’s charm and outgoing personality won Chrissy over. Not to mention, his guitar skills. “She was sweet and cute, and she was googly-eyed when I played the guitar,” Corey remembers. 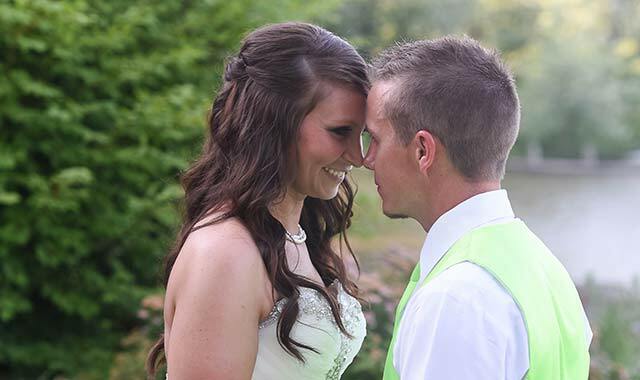 There were a few reasons why the couple decided on Pheasant Run for their wedding day. For one, both Corey and Chrissy’s families had connections to the St. Charles resort. Chrissy’s family often stayed at Pheasant Run for getaways, and Cory’s father had once stayed at the resort for a billiards tournament. “The fact that we each had a little connection was pretty neat,” Chrissy says. But more than that, the couple wanted their guests to enjoy Pheasant Run’s amenities. The countryside property is complete with apartment-style suites, a theater, live comedy, diverse dining options, 18 holes of golf, a full-service spa, tennis and swimming. Pheasant Run provided the majority of the Youngs’ wedding services and had recommendations for all outside vendors, Chrissy says. 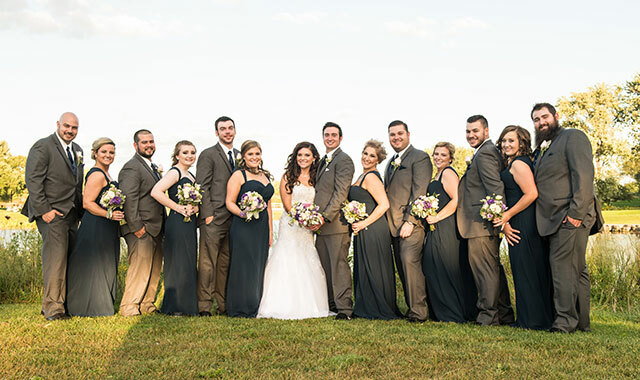 The resort additionally offers lakeside ceremonies, a rain backup location, four distinct ballrooms that accommodate 5 to 1,000 guests, custom catering, professional planning and discounts with local vendors. Chrissy was mentally prepared for something to go wrong, but the Youngs enjoyed their wedding day without any stress or mishaps. The couple is looking forward to their complimentary 1-year anniversary stay. 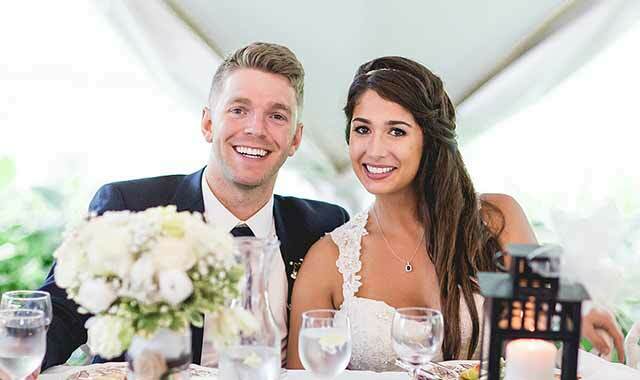 A night out at a Schaumburg bar changed the lives of Kevin and Ashley Schwartz. A mutual friend introduced the two during a night out. After six years of dating, Kevin proposed to Ashley on Christmas morning in 2014, in front of his immediate family. Ashley says she was a little suspicious that day, since Kevin was acting nervous, but she never expected he would propose to her on a holiday. “I was really surprised and happy, and he could barely get all the words out before I said yes,” Ashley recalls. In January 2016, Ashley attended a bridal show at D’Andrea Banquets & Conference Center, in Crystal Lake. 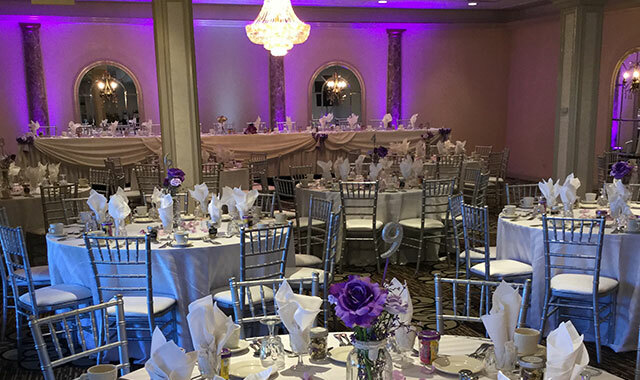 The spacious and elegant venue boasts granite dance floors, crystal lighting and chandeliers, and elegant decorations. D’Andrea has an on-site wedding planner who helps to plan and execute weddings from conception to cleanup. With plenty of wedding packages to choose from, the venue can host a special wedding that fits within any budget. While Ashley attended the bridal show, luck was on her side. She won $1,000 in a door prize giveaway. It was just one more confirmation that she’d found the right venue. Kevin and Ashley were married on June 16, 2017, and celebrated their reception at D’Andrea. D’Andrea offers flexible reception options, which gives couples the chance to customize their wedding experience. But planning ahead is encouraged. “We booked our venue almost two years in advance, since we really wanted the room that included the atrium,” Ashley says. The facility was also able to accommodate Ashley’s love for great food, thanks to expert chefs who take pride in presenting creative and delicious menu options, such as shrimp scampi, lobster tail and filet mignon. If the day wasn’t already special, the die-hard Chicago Blackhawks fans also ran into Pat Foley, the team’s play-by-play television announcer. The couple are still flying high, thanks to their wedding at D’Andrea, and they know the staff played a large role in making their dreams become a reality. Dave and Kaitlyn Kaczmarek may have known each other in high school, but in those days romance wasn’t top-of-mind. The Bloomingdale and Itasca natives floated around the same social circles at Lake Park High School, in Roselle, and followed those same friends through their college years. By the time Dave was finishing school, his friends suggested that he could have some chemistry with Kaitlyn. “I didn’t think I was ready to get into a relationship, but at the same time, I realized it was an opportunity that could pass me by,” Dave says. Pretty quickly, the pair realized they’d found their matches. They found they had much in common, including their casual, get-along personalities. “She’s a genuine person, and truly a sweet soul,” Dave says. By summer 2015, Dave began plotting the elaborate steps for his simple proposal. It began with getting their families together at her family’s northern Michigan lake home. Kaitlyn didn’t see it coming. Once back in the suburbs, the pair discovered that finding the right wedding venue can be challenging. They loved the idea of an outdoor wedding, but they questioned whether it would work with a springtime date. They decided fall was a better option, but still they struggled. “A lot of hotels had nice banquet spaces, but outside they didn’t have much of a view,” he says. That’s when the pair found Bridges of Poplar Creek Country Club, in Hoffman Estates. The public golf course delivers 18 scenic holes of champion golf and boasts event accommodations for up to 250 guests both indoors and out. 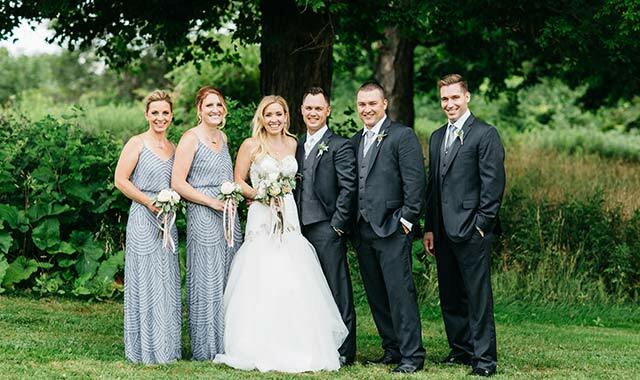 Working with catering supervisor Jennifer Fuller and director of golf Brian Bechtold, the Kaczmareks arranged for an outdoor ceremony at the club’s gazebo, located adjacent to the clubhouse but secluded from the course by a grove of trees. Following the ceremony on Sept. 17, 2016, a line of golf carts stood ready for the wedding party to disembark on their photo shoot. Meanwhile, guests headed to cocktail hour at an outdoor bar that offered just a glimpse of the course’s scenic terrain. Upstairs in the main ballroom, those guests could enjoy full, sweeping vistas. Looking back, Dave credits Fuller, Bechtold and their team for helping to create a flawless wedding. Things really clicked for Karen Ramos and Matt Kiep – in more ways than one. The busy young professionals each decided to test their luck by finding love online. Near the end of 2013, they’d made a connection. By February 2014, they decided to meet for a casual lunch at Colonial Café, in St. Charles. In August 2015, Matt, originally from Batavia, arranged for a photographer to do a photoshoot of Karen in Wheaton’s Cantigny Park. She had always wanted professional portraits of herself. What Karen didn’t know, but Matt and the photographer did, was that a spot had been arranged for Matt to propose. When he did, Karen said yes, without hesitation. “Both families knew it was happening that day, and had been waiting for the good news,” Karen says. When it came time to find a wedding venue, the couple knew they wanted to get married outdoors, in a place surrounded by nature. With hiking trails, large canyons and many outdoor activities, Starved Rock Lodge & Conference Center, in Utica, seemed an ideal location for a wedding. 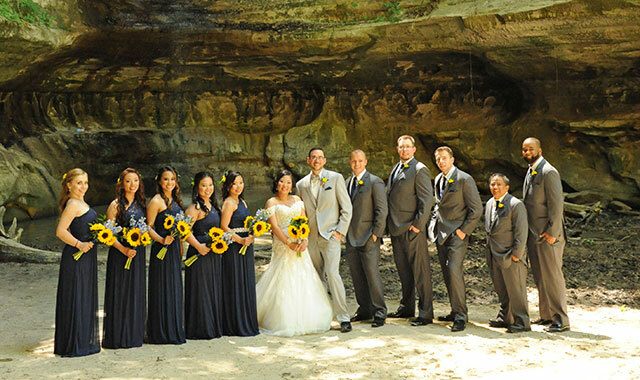 Starved Rock also has several preferred vendors who help to make wedding planning easy. The site was booked in November 2015 for a wedding on June 2, 2017. 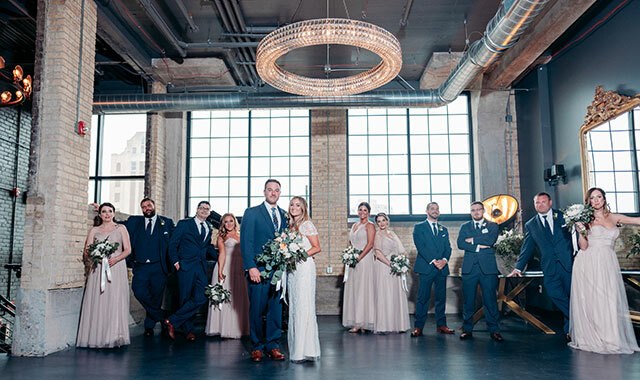 Since Starved Rock is a destination location, lodge staff offered a host of wedding services for the couple, including a rehearsal dinner, rehearsal breakfast and trolley transportation to take photos at the park’s 18 canyons. Typically, space is reserved inside the lodge in case it rains. During the outdoor ceremony, the couple paid their respects to loved ones who’ve passed away. Matt wore a photo locket of his late mother on his lapel. Karen attached something similar on her bouquet, to commemorate her own loved ones who’ve passed away. Karen says having their wedding at Starved Rock was everything they expected and more. 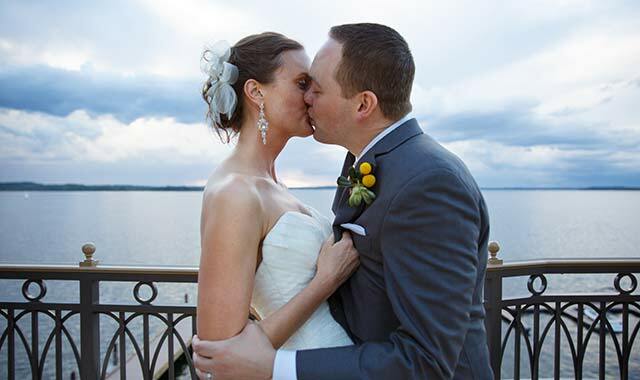 Weddings on the Water: The Edgewater, Madison, Wis.
After looking at a dozen venues in the Madison area, the couple fell in love with The Edgewater. 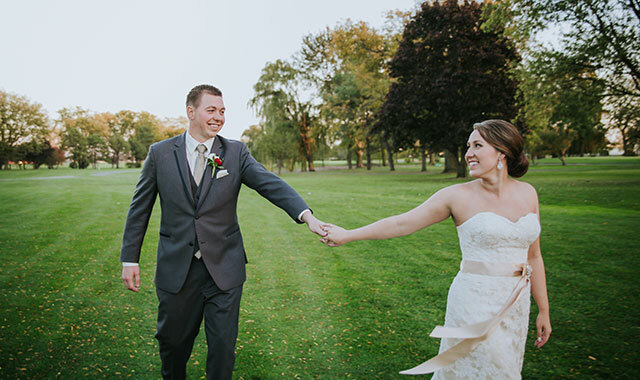 Magnificent, expansive views of Lake Mendota and the City of Madison can be seen from many of the reception and ceremony locations, both indoor and outdoor, not to mention from most of the guest rooms. With incredible scenery as the backdrop, unique indoor and outdoor spaces offer couples the ability to customize their wedding space to accommodate large and small ceremonies and receptions. Working with The Edgewater’s wedding concierge team also helped to make the planning process less stressful. The Edgewater offers the artistry and creativity of some of the best chefs and catering professionals in the region. The resort supplies all food and beverage for events taking place, and wedding cakes or desserts may be provided from a licensed bakery. Exquisite dining options in The Edgewater’s restaurants and private dining rooms serve as the perfect spaces for bridal showers, rehearsal dinners, and pre-/post-wedding brunches. Ideal for groups of 2 to 50, The Statehouse Chef’s Table and The Statehouse Wine Room are just two options on the water, all offering unparalleled views and Modern Midwestern dining experiences. Ballroom Photo: Tim Fitch Photography, Madison, Wis.
Ryan grew up in Crestline, Ohio, and met Jacki when he moved to Chicago in 2003 to attend Universal Technical Institute. After graduation, Ryan moved to Florida to work for Mercedes Benz of Sarasota. Jacki graduated from Illinois State University and moved to Florida to be with Ryan. She moved back to Wheaton in 2011; Ryan followed about two years later. The time and location were just right when the two were wed over Fourth of July weekend. On July 2, 2016, Jacki and Ryan said “I do” under a spacious clear-top tent next to the Nature Center, surrounded by 140 guests and the forest scenery. 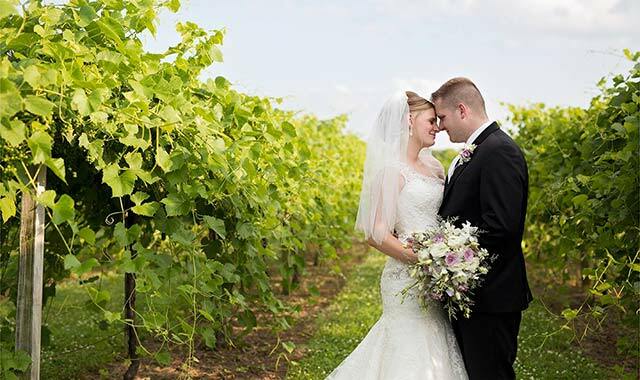 Ever since they opened Famous Fossil Vineyard & Winery, in Freeport, Ken and Pam Rosmann have been asked about hosting weddings on their beautiful, rolling property in northwest Illinois. For the longest time, it just wasn’t possible to accommodate such a gathering. 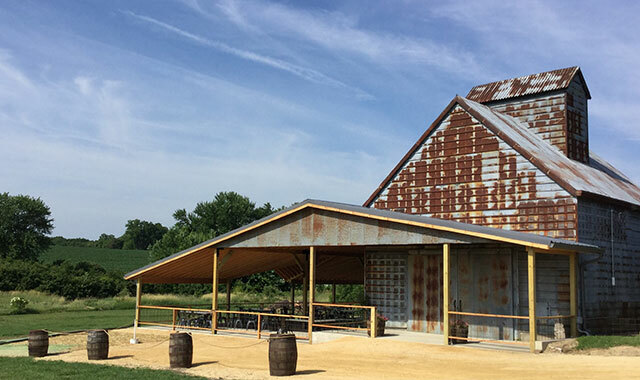 But things are changing with the introduction of The Crib at Famous Fossil, a social events space housed inside the winery’s beautifully restored 1930s-era corn crib. The Crib and its adjoining shelter draw together the elegance of wine country with quintessential rustic elements – rusted steel, aged wood, antique equipment, and plenty of Midwestern character. Families that choose to host a wedding at Famous Fossil can celebrate intimate ceremonies and receptions inside The Crib, which seats about 130 theater-style and about 80 at tables. The area overlooks a bridge and the gently rolling slopes where cornstalks and nearly 2,100 grapevines reach skyward. Rustic decor around The Crib and the winery leaves brides with little need for extra ornamentation. Pam offers props like candelabras and steel or wicker arches, but she finds that little else is usually needed. To that end, set-up and cleanup services are provided with every space rental. Families that rent The Crib also receive access to wedding coordinator Sarah Thies, tables and chairs, and a customizable menu sourced as locally as possible. Playing on the winery’s nine-year tradition of serving small dishes or fruit and cheese plates, this menu offers several choices for families. Grilling for these buffet-style meals is provided by a local caterer who serves choice cuts of meat, often sourced from local farms. This being a winery, Famous Fossil wines and local craft beers round out the bar options. Famous Fossil is best known for its wine blends, which mix varietals of cold-weather grapes – names such as LaCrescent, Marquette, and Frontenac that are well suited for the Illinois climate and fossil-rich limestone deposits feeding Famous Fossil’s grapes. Famous Fossil hosts its very first weddings late this summer – the perfect time to capitalize on the rich colors of the vineyard. One of the St. Charles area’s newest social events spaces is really more of an old friend with a new face. 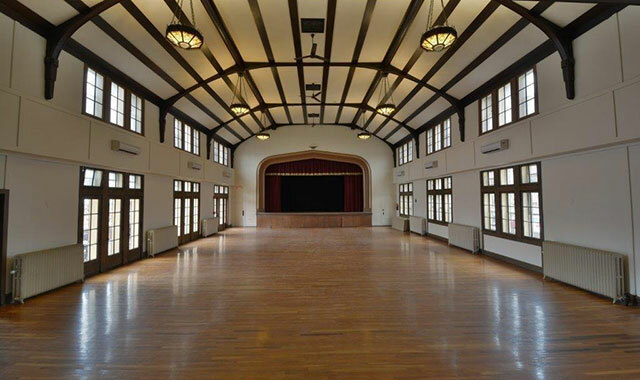 Built in 1926, the Baker Community Center, in St. Charles, re-opened this spring after extensive renovations that make it more accessible, more comfortable, and more beautiful than ever before. “It’s really beautifully renovated, and the character of the building remains,” says Connie Kurr, rental contact. The newly renovated venue now boasts air conditioning, elevators, handicap-accessible bathrooms and a modernized kitchen for caterers and event chefs. Located just off Illinois Route 31 is a ramp to help visitors more easily reach the elevator that rises to the main level. Brides can rent two spaces at Baker Community Center: The Collins Auditorium and The Peterson Lounge. The auditorium seats up to 150 people and is ideal for gatherings of all kinds, with its high ceilings, a raised stage and ample daylight spilling in from several banks of windows. The lounge, complete with a fireplace, seats about 40 people for small receptions, business meetings and gatherings, but it can also be arranged to host intimate wedding ceremonies. Facility rentals come with custodial services including set up and take-down, in addition to equipment like tables, chairs and a sound system. The kitchen and a piano and are available upon request, with a small one-time fee. The Baker Community Center has long been popular for get-togethers of all kinds, including wedding receptions, graduations, business meetings, anniversary parties and birthday parties. Conveniently, the facility has no restrictions on food and catering, leaving families to choose the most optimal meal options for their event. Dates fill up fast at Baker Community Center, so Kurr recommends booking at least six months in advance. Spring and fall are often the most popular times for bookings of all kinds. The attractive Tudor-style architecture outside the Baker Community Center offers just a hint of what’s inside. Dark wood tones and classic 1920s-era architectural detailing create a classic, formal backdrop for weddings. Recent facility improvements have preserved and enhanced those classic features while adapting to modern needs. The scenic terrace, for example, is now more readily accessible from the lobby, which also received an update and now combines classic architectural detailing and fixtures with a more modern touch. The building was dedicated in May 1926 as a memorial to veterans of World War I and Henry Rockwell Baker, son of local businessman Edward J. Baker and his wife. For almost a century now, the building has hosted civic events, programming and social gatherings. Rockford native Libby Leatherby’s wedding was a happy occasion for many reasons, especially because her son, Noah, was there to see his mom get married. Just two months after Mitch Leatherby proposed to Libby on Mother’s Day, in 2015, Noah was diagnosed with alveolar rhabdomyosarcoma, a rare cancer that forms in muscle tissue. The couple cancelled their wedding plans to take care of Noah. As the months progressed, Noah’s health started to improve. The more his health improved, the more his parents planned that wedding they’d left behind. In the spring of 2016, when it came time to search for a wedding venue, the couple learned of The Standard, a wedding venue that was then still in the works. It’s owned by Brent Hughes and his wife, Betsy – both personal friends of Libby’s. Their new venue, which opened late in 2016, takes advantage of the decades-old building by putting on full display its beautiful concrete and red brick skeleton. Libby says their May 20, 2017, wedding couldn’t have gone better. Whether it’s weddings or another social occastion, The Standard’s crew helps to eliminate many of the hassles and stresses of a wedding day. The rooftop patio is equipped for outdoor weddings, and it provides a sweeping overlook of downtown Rockford’s rooftops and riverscape. An adjacent conservatory and full bar provide a great location for cocktail hour. Down on the second floor is a 260-guest dining hall with all of the amenities for dinner and dancing. Food is provided by Chef Paul Sletten, who owns several downtown Rockford staples. London Avenue Designs, which specializes in interior decorating, wedding planning and event design, is stationed on the building’s first-floor retail area. Libby, her bridesmaids, her mother and mother-in-law had their hair and makeup done at Arch, a beauty boutique also located on the first floor of The Standard. “Everything that we needed was taken care of inside one building, which was extremely convenient,” Libby says. Noah, who has now been in remission for nine months, served as the ring bearer. Brittney Kulisek was impressed with Tom Chambers when she met him on a blind date. He was cute and chivalrous, and his great sense of humor kept her laughing for hours. Tom was similarly smitten at first sight. Though Brittney lived in DeKalb and Tom lived in Rockford, Tom knew after only a week that he wanted to someday marry Brittney. He proposed a couple of months later when the couple were on vacation in San Antonio, Texas. The couple began searching for a wedding venue immediately. 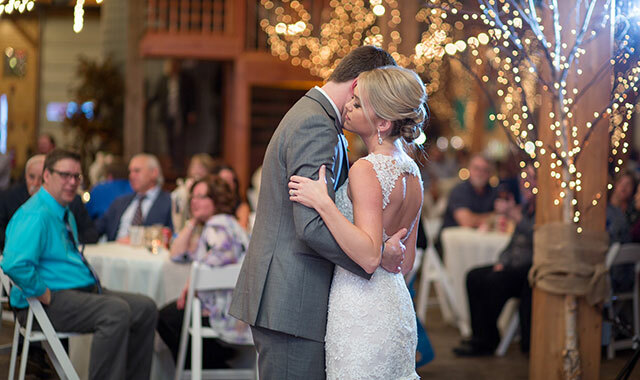 Tom’s sister recommended Oak Lane in Oregon – a unique 1800s dairy barn remodeled into a chic reception hall. Set on 16 acres, Oak Lane offers five outdoor ceremony locations as well as an indoor space that can accommodate up to 180 guests. Receptions are held in the barn’s hayloft upstairs. Adding character to the venue are two potbelly pigs, Baconette and Hambone; two llamas, Dilly Dally and Tessa; a Belted Hampshire sheep named Lucy and a lamb named Lambchop. Oak Lane was the first and last venue the couple looked at. Brittney and Tom were married on May 13, 2017. Oak Lane’s owner, Jodi Horner, was always quick to respond whenever the couple emailed with questions. She even provided intentionally mismatched wooden chairs, tables, linens, bartenders and decor items. Guests could dance the night away upstairs, hang out at the bar downstairs, or venture outside to enjoy a “bride’s cigar bar” set up by Brittney’s dad. The couple made their wedding unique by setting up lawn games and by catering woodfire brick oven pizza. Brittney’s advice is to trust Jodi to make your day perfect. The No. 1 priority when searching for a wedding venue was finding a location with a waterfront view. The couple was thrilled to find Maxson Riverboat and Riverside Restaurant, in Oregon, for their June 25, 2016, wedding. A longtime favorite for casual dining, banquets and dinner cruises on the Rock River, Maxson had the beautiful views the couple hoped for. And, it was close to Polo, where Ken grew up and where the couple now live. When it comes to rubber meeting the road, Chelsey and Randy Simpson know what to do. Chelsey, a Stillman Valley native, grew up around drag racing and the Byron Dragway, which her family owns. Streator native Randy was a general manager for Lucas Oil Raceway at Indianapolis when he spied Chelsey and her signature blue Camaro at an Indy race in September 2015. Soon into their first date, the pair found they had a surprising amount in common. “Our joke was that we realized we were both left-handed drag racers who drive Camaros,” Chelsey says. When Randy eventually moved back to Illinois, their romance charged ahead. Just before Easter 2016, Randy had a surprise waiting for Chelsey on a romantic getaway to Shawnee National Forest, in southern Illinois. At the top of a rocky outcrop, Randy pulled something from the bag and turned to Chelsey. “He said to put on this blindfold and put in these earplugs. I’ll be right back,” she says. What she couldn’t see or hear was Randy removing from his backpack a tripod, a camera and a velvety box. As the blindfold and earplugs came off, Chelsey saw him down on one knee. “It was a total surprise,” she says. Soon, the couple were looking for wedding venues close to home. They admired the rustic barn look and quickly discovered Barnacopia, in Polo. The barn-like building is part bed-and-breakfast, part museum and part social gathering space. Its three floors include displays of antique tractors and old cars, in addition to several settings that are ideal for wedding receptions and ceremonies. One look inside was all it took to sell Chelsey and Randy. 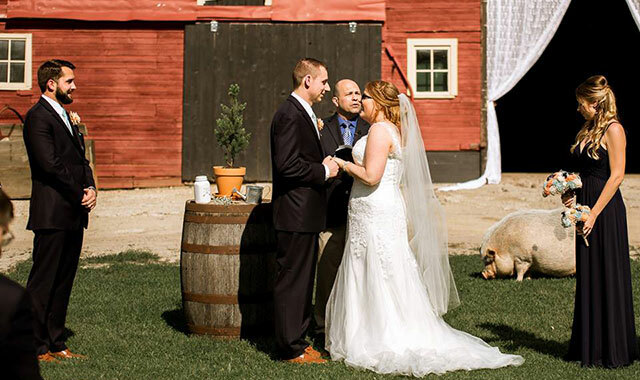 The venue is owned and operated by a family who farms the surrounding land, so the couple were treated like family throughout the planning process. Any time Chelsey had a question, she received quick responses from events planner Rachel Davis. Owner Gary Bocker welcomed the couple any time they visited – including the day before the wedding, as the family arrived to decorate. Chelsey and Randy were married April 1, 2017, at a nearby Catholic church. Before they arrived at Barnacopia for the reception, their guests strolled the displays inside. By the end of the night, the new couple were headed to a private suite inside the barn’s silo, where they planned to stay the night. They awoke the next morning to find breakfast prepared downstairs – just another of many family-like touches. Bride’s Gown: Brandi’s Bridal Galleria, New Glarus, Wis.
Jenn quickly got to work searching for a wedding venue. After touring Oscar Swan Country Inn in Geneva, she knew immediately it was what she wanted. The 8-acre estate with a cozy bed-and-breakfast reminded her of her grandmother’s home. The backyard and garden space accommodated all 150 of the couple’s guests for the June 4, 2016, wedding. This entry was posted on Tuesday, July 18th, 2017 at 12:00 pm	and is filed under Northwest Woman, Top Posts. You can follow any responses to this entry through the RSS 2.0 feed. Both comments and pings are currently closed.